A number of people in the Scooter community already know this, but Rally De Los Muertos is officially up and open for registration! A lot of work has gone into the conceptualization and planning of this Scooter Rally. This will be the first Scooter Rally in the City of San Antonio since Amerivespa in 2010 and first locally organized Rally since Third Coast 5 in 2009. In that time, the local scooting scene has changed a lot in terms of the local faces that still ride on two wheels and the organized clubs that still operate in the area. I’ve wrestled with the idea of starting another scooter club for sometime… but I didn’t want to do it unless I knew the people who wanted to be in the club had the same passion and creative spirit to do things the right way. I have to quickly give thanks to friend and now club mate Clay for getting Rally De Los Muertos started. The theme was completely his idea. I’m delighted to know that he heard me out when I strongly suggested we target the Halloween weekend for a scooter rally. Shortly after getting the URL secured, I stopped by Clayton’s house with a bottle of Old Savannah in hand and pitched the idea of doing the rally in three parts/three acts. 2.) I wanted to do something that had never been done before. I wanted to present our rally patches in a puzzle pattern. People who attend the rally this year, will not only get t-shirt, but they’ll also be getting the first installment of three Rally De Los Muertos patches that will one day all come together to complete a full 3 part patch. To do this, I reached out to a local graphic artist who had put together some incredible show posters for shows in the local area. As luck would have it, his interest in scooters and the scooting scene has always been inside of him so he jumped at the opportunity to collaborate with me on this insane idea. 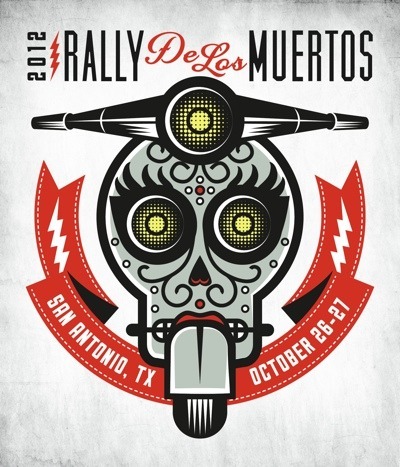 He put together a logo for our rally after exchanging some emails and two quick phone calls… and as soon as that was done - Rally De Los Muertos became a living breathing reality. That was mid-june and since then, we’ve booked some venues, hooked up with some incredible sponsors and if all goes well - we hope to announce some big things in the coming weeks. One of the biggest things I’m looking forward to announcing is the name of our Scooter Club… that will have to wait a little while longer tho’.